Meadows Bank announced that David Boser, Senior Vice President, Commercial Loan Officer recently graduated from the prestigious Pacific Coast Banking School (PCBS). These executives completed a rigorous three-year graduate-level educational program designed for leaders in the financial services industry. Las Vegas, NV, September 27, 2018 — Meadows Bank announced that David Boser, Senior Vice President, Commercial Loan Officer recently graduated from the prestigious Pacific Coast Banking School (PCBS). 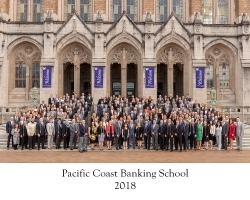 Pacific Coast Banking School, in partnership with the Foster Graduate School of Business at the University of Washington, offers a unique combination of world-class faculty, cutting-edge curriculum, and highly qualified participants that defines it as The Premier National Graduate School of Banking™. Founded in 1938, this prestigious school boasts over 11,000 alumni. This year’s graduating class consisted of 223 individuals representing a diverse mix of financial institutions from thirty-six states, Guam and the Marshall Islands. These executives completed a rigorous three-year graduate-level educational program designed for leaders in the financial services industry. In addition to earning a graduate level certificate in the business of banking, this is the first year that the participants also received a Foster School of Business Executive Education Certificate in Executive Leadership Training from the University of Washington. “David’s participation in the three-year program at PCBS provided him an excellent opportunity to enhance his leadership and management abilities, complementing the bank’s own internal training and development efforts,” said Arvind Menon, president and chief executive officer of Meadows Bank. Meadows Bank is a full service community bank committed to valued partnerships with our clients. Our relationship-based approach to banking focuses on making decisions locally, close to our clients. The bank offers a full suite of lending and deposit products and services. Meadows Bank was founded in 2008 in Las Vegas, Nevada and currently has branches in Las Vegas, NV; Henderson, NV; Reno, NV; Pahrump, NV and Phoenix, AZ. Loan production offices are located in Arizona, California, Nevada, Oregon, Texas and Utah. For more information on the bank and its products and services please visit our website at www.meadowsbank.bank.